In this article: Learn which crops are the best garlic companion plants to increase garden harvest, reduce pests, and improve flavor. Companion planting with your garlic can help your garden grow better, taste better, and have less problems with pests. So how does companion planting work? What can you grow with garlic and what should be kept far away? First off, garlic is a member of the allium family. Other alliums include onions, leeks, shallots, and chives. 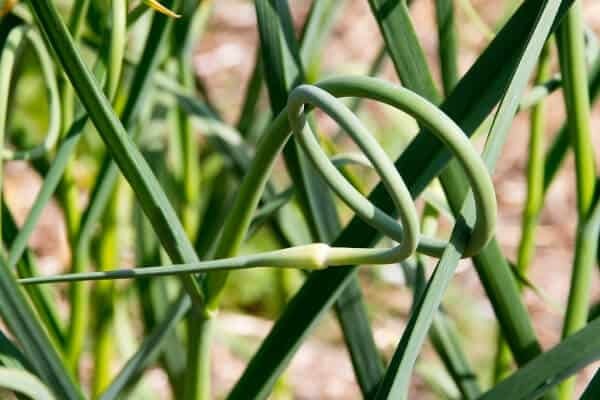 Below you will find a list of garlic companion plants that you can grow alongside your garlic to prevent pests and disease, or just help your garden grow and taste better. Plus a list of what you should keep separate from your garlic bed. Companion planting does take time to plan each year, so check out my Yearly Garden Planner to help you plan your garden beds before you plant so you can take advantage of companion planting! Companion planting has a lot of benefit including improved flavor and better growth. It’s important to plant crops that don’t compete for nutrients and also complement each other. Below is a list of plants to grow with your garlic to help you grow your best garden ever! Lettuce: Lettuce and garlic make great companions. They do not compete for nutrient in the soil and they are both grown in the cooler seasons. Garlic can also help deter insects from eating your lettuce. Spinach: Because spinach grows in the cool season, and often can be overwintered, it is a perfect garlic companion plant. Spinach can help suppress weeds in early spring when the garlic is doing the most growth. Chamomile: Growing chamomile with your garlic can help improve the flavor and growth of your plants. Other herbs such as summer savory and dill can have the same effect. Beets: Beets and garlic roots draw from different soil levels and won’t compete for nutrients. They grow in the same season, so they are natural companions in the same bed. Garlic may also protect your beets from some fungal infections. Tomatoes: Garlic can do a lot for your tomato plants including improving the flavor of the fruits. Garlic can also help deter pests like red spider mites and aphids in your tomatoes. Try planting a garlic border around your tomato rows. Peppers: Peppers are nightshades like tomatoes and will get the same benefits as tomatoes when planted with garlic. Peppers and garlic mostly occupy different seasons, but planting young peppers before your garlic harvest can protect them from pests and disease. 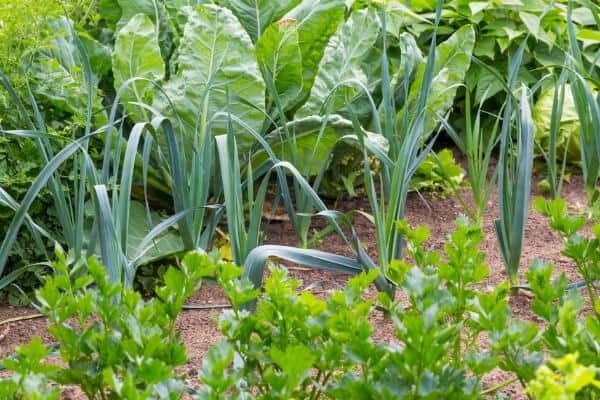 Pests can be a big problem in organic gardens, or any garden, but luckily one of the main benefits of companion planting is to naturally deter and eliminate many of these pests. Garlic is actually one of the pest natural pest deterrents you can plant in your garden. It’s very pungent and can confuse the sense of smell or repel many insects. Companion planting with garlic can help deter: moths, gnats, spider mites, aphids, ants, snails, Japanese beetles and more! Below are some of the best garlic companion plants to help control some of the main garden pests. Cabbage: Garlic is a great companion for cabbage. Garlic can help repel lots of pests that can feed on your cabbage such as cabbage loopers, cabbage worms, aphids, and Japanese beetles. Broccoli: Broccoli is also in the cabbage family, so garlic will repel the shared pests. This goes for not just broccoli, but brussels sprouts, kale, collards, and other brassicas. Carrots: Garlic and carrots offer each other a symbiotic relationship. Carrots will help deter insects that feed on garlic and garlic will help repel the carrot fly. Celery: Celery is also in the carrot family. Companion planting garlic with your celery will help deter pests that might feed on your celery plants. Rue: Planting rue with your garlic can help repel the onion maggot that can infest your bulbs. Fruit Trees: Fruit trees can also benefit from companion planting with garlic. Garlic will help repel borers and mites. It can also help protect against things like apple scab or leaf curl in peach trees. Garlic is a great crop to scatter around your garden. You can use it to border your beds or interplant within beds. Spreading your garlic out around the garden will also help reduce the chances of your garlic getting attacked by the onion maggot. Garlic isn’t too picky, but there are a couple of plants that should not be planted near garlic due to either flavor contamination or chemical interactions. Beans: Garlic should not be planted with any type of beans. Garlic may stunt the growth of beans. This goes for all members of the allium family as well. Peas: Peas are legumes like beans. Keep garlic away from all legumes including peas. Sage: Many farmers say that sage is harmful to garlic and that it can stunt the garlic’s growth. Asparagus: Garlic should be kept away from asparagus. It can both stunt the growth it’s growth and contaminate the flavor. *Strawberries: Strawberries often end up the good companion list for garlic. And it is true that garlic can help prevent pests and fungal disease, but there is also some evidence that garlic will stunt the growth and affect the amount of berries your plants produce. Other Alliums: Growing other alliums closely together can cause more trouble with onion maggots. Spreading them through the garden will control the pest. 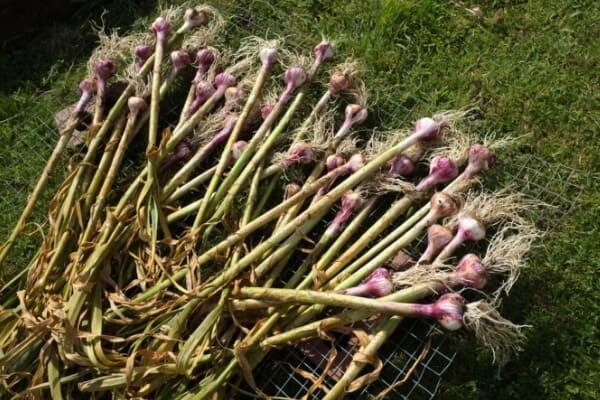 Once you have harvested your garlic, check out some of the following articles to learn how to store, use, and preserve your harvest! And that’s it for companion planting with garlic. Take this information into account while planning your garden in the spring and you will see the benefits of companion planting! Don’t forget to pick up a copy of my companion planting chart below!